Domino's Pizza says it has fired two US employees who posted videos online of themselves behaving "inappropriately". Domino's added that the affected franchisee had filed a criminal complaint against them and there were warrants for their arrest. One of the videos, viewed on YouTube, appeared to show a staff member putting cheese up his nose and breaking wind on salami while preparing food. Domino's said it apologised for the actions of the individuals concerned. 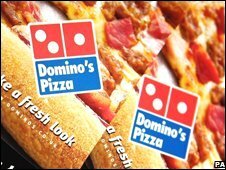 The company said the videos overshadowed "the hard work performed by the 125,000 men and women working for Domino's" in the US and around the world. Domino's said that the employees involved viewed the video as a prank and the food was never delivered. However, a spokeswoman said that the company was "not in a forgive-and-forget mood". She added that the police had issued a felony warrant for the two people involved and the company also planned to file a civil lawsuit.